There is a growing medical emergency in our society caused by the constant growth in the number of people affected by untreatable bacterial infections. The discovery of antibiotics in the early 20th century gave us decades of relative safety, a period that is coming to an end the antibiotics that saved millions of lives in the last century are increasingly powerless against a growing number of antibiotic-resistant bacteria. According to the U.S. Centers for Disease Control (CDC), more than 23,000 Americans die each year from infections caused by germs resistant to antibiotics. While this number in itself is alarming, the scary thing is that unusually resistant germs bacteria that are resistant to all or most antibiotics tested and are uncommon or carry special resistance genes are constantly developing and spreading. The scientists at the CDC, who are not prone to panic easily, call this type of bug nightmare bacteria. Lab tests in the U.S. uncovered unusual resistance more than 200 times in 2017 in these nightmare bacteria alone. This problem is not new. Already in 2012, the then Director General of the World Health Organization (WHO), Dr Margaret Chan, has warned vividly that the growing threat of antibiotic-resistant bacterial strains may pose grave risks for society: "A post-antibiotic era means, in effect, an end to modern medicine as we know it. Things as common as strep throat or a child's scratched knee could once again kill." Chan pointed out that there is a global crisis in antibiotics caused by rapidly evolving resistance among microbes responsible for common infections that threaten to turn them into untreatable diseases. Every antibiotic ever developed was at risk of becoming useless. A work recently published in Science ("Molecular mechanism of extreme mechanostability in a pathogen adhesin") may offer some hope. Using a combination of laboratory experiments and GPU-accelerated supercomputer simulations, researchers discovered why staph bacteria the leading cause of healthcare-related infections can be so tough to beat. This work could point the way to new treatments for now-invincible bacterial foes, not by developing a new antibiotic that would kill these bacteria, but by making them weaker so that they get more easily attacked by our immune system. Staph infections are caused by staphylococcus bacteria, types of germs commonly found on the skin of healthy individuals. Most of the time, these bacteria cause no problems or result in relatively minor skin infections. The research team showed that methicillin-resistant Staphylococcus aureus (MRSA) adhere to their hosts us humans with exceptional mechanical resilience. That's what makes pathogenic bacteria so persistent. "Understanding the physical mechanisms that underlie this persistent stickiness at the molecular level is instrumental to combat these invaders," Rafael Bernardi, a research scientist in the Theoretical and Computational Biophysics group at the Beckman Institute, tells Nanowerk. Combining experimental and sophisticated computer simulations, Bernardi and the late Klaus Schulten from the Beckman Institute teamed up with Lukas Milles and Hermann Gaub from the Physics Department at Ludwig-Maximilian-University Munich to decipher the mechanism responsible for staph adhesion. Using an Atomic Force Microscope (AFM), the University of Munich team was able to measure the forces that govern the interaction between an individual adhesin (a staph protein) and its human target molecule. Independently, the Illinois team investigated the same protein complex by performing computationally-intensive steered molecular dynamics (SMD) simulations, carried out using the NCSA’s Blue Waters supercomputer, deconstructing the mechanism of the interaction between staph adhesion factors and human proteins. 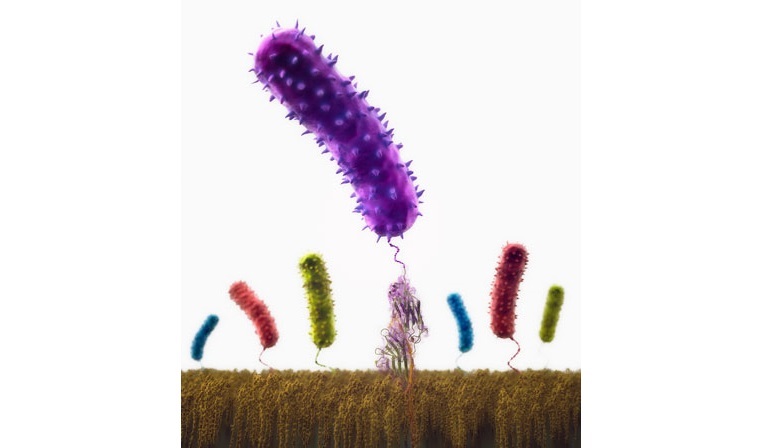 The scientists were surprised by the shear forces that were necessary to rupture the interaction between the bacterial and human proteins: they are much stronger than any other non-covalent interaction known. They discovered that the mechanism that makes staph bacteria cling so tightly to its human host is a series of hydrogen bonds arranged in a corkscrew shape that works like superglue to clamp bacteria protein molecules to human ones. "It’s easy to break one hydrogen bond," says Bernardi. "What makes this attachment so strong is that you have to break all the bonds at once in order to detach the protein molecules." "The unbinding force of a single adhesin-human protein complex measured was exceptional, about an order of magnitude stronger than any other protein-protein interaction known," he continues. "The rupture forces reached over two nanonewtons, a regime generally associated with the strength of covalent bonds, and nearly an order of magnitude stronger than most other protein-protein interactions known." The combination of innovative simulation methods and experimental confirmations showed that the extreme physical strength of the staph adhesion is largely independent of protein sequence and biochemical properties, but rather a built-in physical property an invasive advantage for these staphylococci. The whole description of this unexpected mechanism is new and shows how bacteria evolved to take advantage of simple hydrogen-bonds in an remarkable way. These findings expand our understanding of why pathogen adhesion is so resilient and may open new ways to inhibit staphylococcal invasion. Understanding the mechanism of staph infection at the molecular and now atomic level may open new avenues for an intelligent design of antimicrobial therapies. The development of anti-adhesion therapy could promote the detachment of staph bacteria, facilitating bacterial clearance by our own immune system. "The main challenge now is to design a drug that targets this bacterial adhesion mechanism and either blocks or at least weakens it," Bernardi concludes. "As a more general aspect, the combined use of AFM experiments and SMD simulations should greatly contribute to the identification of new binding mechanisms in bacterial adhesins, thus helping to show how they regulate biofilm formation. In diagnosis and therapy, this combined approach could represent a powerful platform for the treatment of microbial infections"
Thanks for sharing this information.Its really a great article. Its such a good informationn and Easy to undrestand.